Bimal Gurung called a two-day education strike in the hills this week and a series of marches during the chief minister's impending visit to protest the state government's move to make Bengali a compulsory subject at schools. The Gorkha Janmukti Morcha president announced the agitation at a session convened by the party with Nepali literary figures, college professors, representatives of educational institutions in the hills and social organisations like Gorkha Dukha Niwarak Sammelan, teachers and other apolitical people here. "The government is trying to force a language on us and its not acceptable. We will protest the move vehemently and I will personally take to the streets. We will request the closure of all educational institutions in the hills on June 1 and 2. 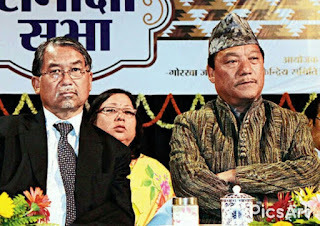 I am hearing that they (Mamata Banerjee) will be coming to Darjeeling on June 4 and during this period, we will show our resentment by holding marches with black flags across the hills from June 4 to 8 (during chief minister's entire stay in the hills)," Gurung told the gathering at Gorkha Rangamanch Bhavan. The protest against the Mamata government's decision to make the learning of Bengali compulsory at schools across the state seems to be moving out of the realms of political domain. Representatives of top schools in the hills, like St Paul's School and St Joseph's School (North Point), were preset at the meeting called by the Morcha. Before Gurung had announced the strike, the gathering called upon him to start a strong movement on the matter. In the hills, most students have English as their first language and Nepali as the second language. Making Bengali compulsory would mean that there would be no choice left and it would be a tall task for educational institutions in the hills to find teachers for Bengali language. Gurung said he would participate in the marches from June 4 onwards in Darjeeling. In the hill town, the procession will be taken out from Ghoom to Darjeeling town, a distance of 8km. He has called for similar marches across the hills and the Dooars and the Terai as well. "If the need arises, we might even call a general strike in the days to come," said Gurung. Language has been a major issue in the hills, which had agitated for almost three decades for the recognition of Nepali in the Eight Schedule of the Constitution. Nepali was listed in the Constitution in 1992. The Bengal government had recognised Nepali as an official language for the hills in 1961. Jiwan Namdung, a Sahitya Academy award winner, said at the meeting that "making Bengali compulsory is wrong and unacceptable". "Since the government is looking at making Bengali mandatory in the hills, can they reciprocate by making Nepali compulsory in the plains, too? We salute their decision to safeguard their language but they have to address our concerns, too," he said. Prem Pradhan, also a Sahitya Academy award holder, spoke on similar lines and said the decision could be a sinister ploy to "suppress the Gorkhaland demand". Bishal Thapa, the secretary of the Hill College Professors' Association, said: "While Bengali language is being made mandatory, provisions have not yet been made to make Nepali literature an option in the state civil services examinations. In State Eligibility Test, Nepali is not a language in which one can sit for the examination. There is a political motive behind the move to make Bengali compulsory." Political observers believe if the state government does go ahead with the language decision, it might have to face widespread backlash given the sentiments attached to the language in the hills. Gurung said: "Such giants of the society are with me today, not to support the Morcha but to stand by the community. I request all other parties to participate in the protest setting aside all political differences." 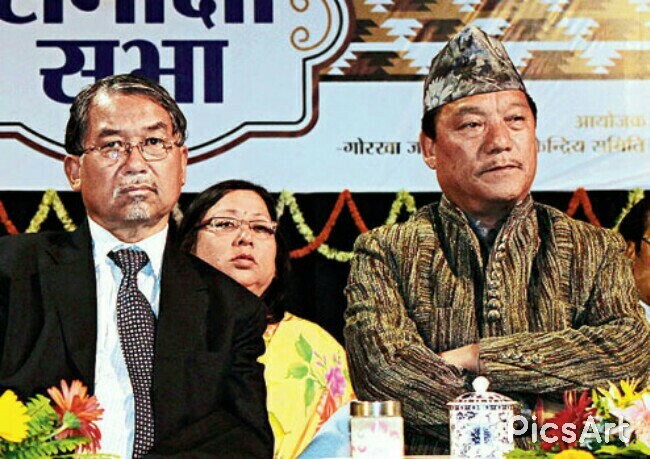 In pic: Gurung (right) at the meeting with literary figures and academicians in Darjeeling on Tuesday.